Prepare yourself a strong coffee because the data shown here will have to be read twice. In the last post we showed how to connect the simpleRTK2B shield to a NTRIP correction service. Now we will talk about the performance we got by using this configuration. We used the functional prototype of the simpleRTK2B shield. It looks different than the final product, but the GNSS performance is exactly the same. We used our freshly received active antenna from u-blox. We are running in parallel a comparison between u-blox antenna, Tallysman antenna and Ardusimple antenna and we will publish it soon. The performance of this antenna is very similar to ours. The performance figures are obtained by using the ERGNSS network from the Instituto Geográfico Nacional, in particular the mountpoint CERCANA3. The performance you observe will depend on the type of NTRIP corrections. The one we used is very standard. The data shown in this post is not post-processed and you should be able to get the same results by analyzing the logs. We went to a well known triangulation station to compare the results obtained by the simpleRTK2B with those obtained by high end GNSS stations. The data we will use is the one inside the green rectangles (latitude, longitude and ellipsoidal height + pillar height). 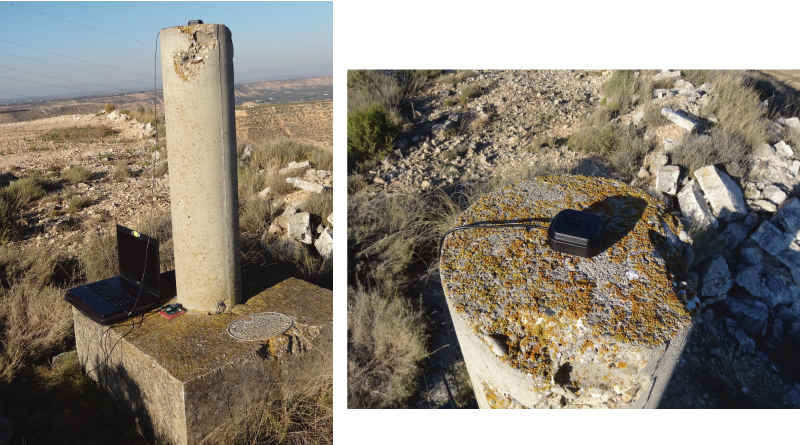 This picture shows the test configuration, with the simpleRTK2B and the antenna placed at the top of the pillar. Fix after cold start after 13s, steady state 3D accuracy ~0.54m after 100s from start. NTRIP connection at t=124.7s and RTK fix in less than 6s. Estimated 3D accuracy with NTRIP corrections of 17.29mm during the whole time. 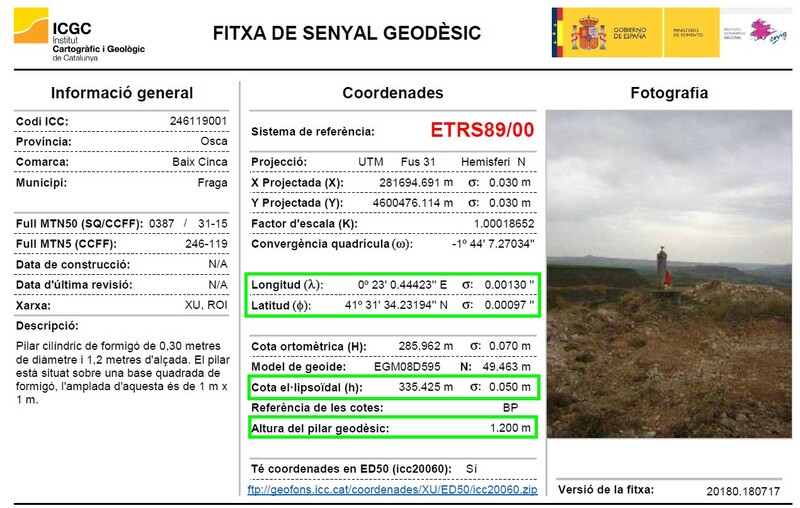 The black crosses are the position and ellipsoidal height defined in the geodetic data. The black dotted line represent the 95% confidence interval of these measurements. The green crosses and lines show the position and ellipsoidal height provided by the simpleRTK2B. 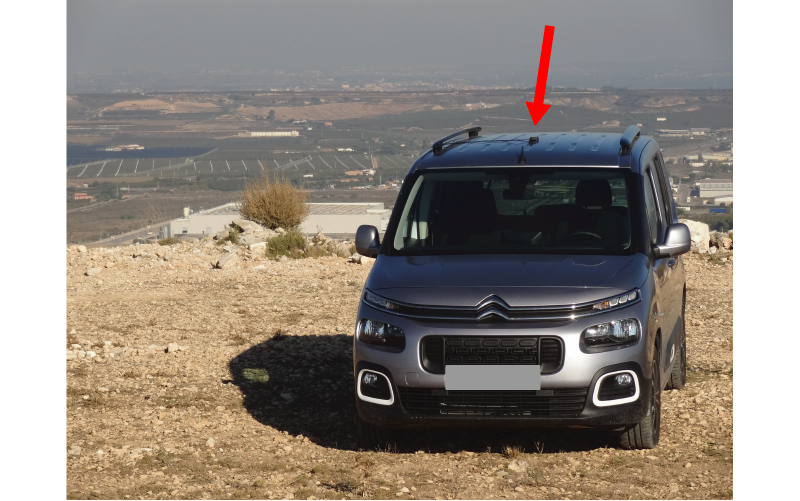 For this test we placed the GNSS antenna at the top of a van and we drove ~25km in a highway. Since we don’t have a true reference to compare our results it is difficult to quantify the performance. We can use the ZED-F9P 2D accuracy estimation value as a reasonable variable to evaluate the performance. In the above figure we plotted the path of the van in different colors based on the 2D accuracy. At the end of the path (it starts from the bottom), we couldn’t get a RTK fix and the simpleRTK2B stayed in RTK float with an accuracy around 5cm, probably due to the distance from the NTRIP station, which was located more than 25km away. As you can see, the ZED-F9P module in the simpleRTK2B shield maintains a good fix at speeds ~120km/h (safety first :)). The intermittent decreases in 2D accuracy are caused by bridges crossing the highway and some truck overtakings. We exported the path into Google Earth and by counting the number of blue sections in the figure path, you will get the number of bridges crossing the highway! The red arrow indicate the bridge location (click image to enlarge). Affordable high precision is really here!